Whenever one of my daughters has a birthday, my mum (aka Bugsy) who lives about 1500kms away on the great Murray River, comes to visit. 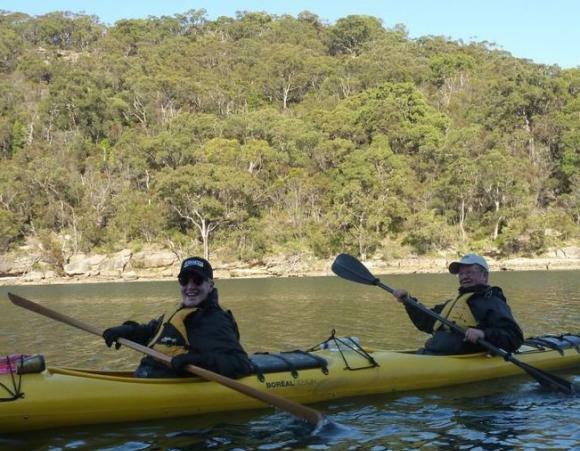 When she last came in January, she came and relaxed on the beach at Sydney Harbour Kayaks whilst I had a paddle, and mesmerised by the beauty of Middle Harbour, decided to try kayaking herself. 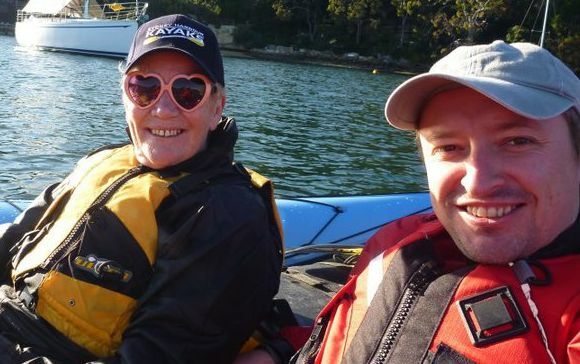 A month or so later she bought herself a little sit on top and with her partner Richard (aka Sunshine) has been paddling the reaches of the Murray ever since. 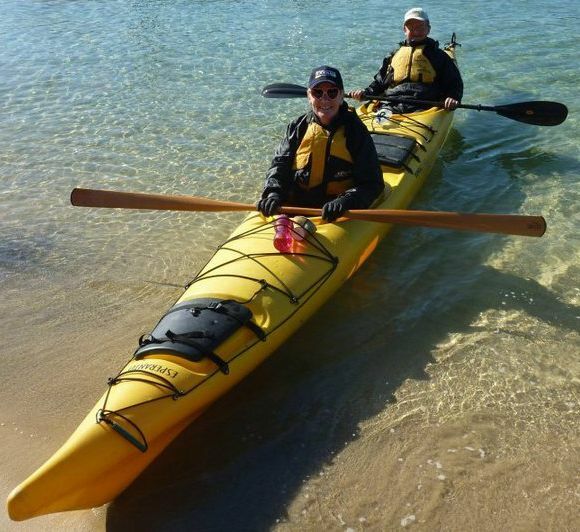 With my eldest daughter turning four, mum decided to add a Sydney paddle to her itinerary. So in the dark early hours of Sunday morning, Bugsy, Sunshine, Grumm and I head off for the beautiful beaches at The Spit. Shannon at Sydney Harbour Kayaks had a nice stable double set-up ready for the two visitors, and we promptly head off into Middle Harbour. 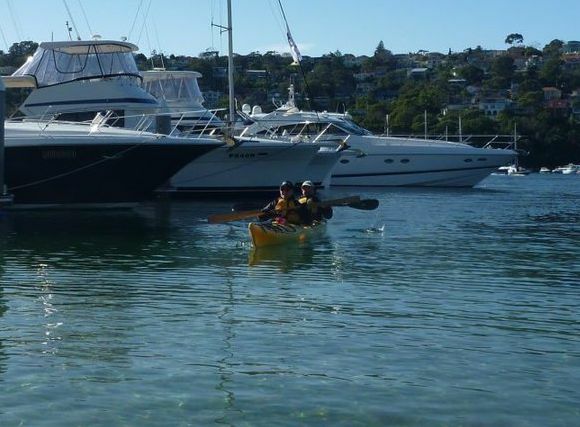 I love the first reactions of new paddlers to Sydney, as they are captivated by the beauty of the Middle Harbour and astounded by the expensive houses and boats that line her shores. Bugsy and Sunshine were no different, oohing and ahhing at the incredible real estate on show. 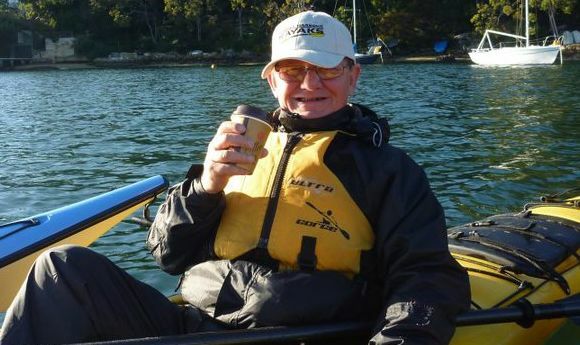 Once we turned heading for Bantry Bay, I had one thing on my mind – the Coffee Boat. We were running a little late and the Bugsy/Sunshine double kayak was, err, going at a “slightly slower” pace than either Grumm or I are used to. And with about 1.5km to go, I just made out the small golden profile of Garry and his little coffee tug leaving Bantry Bay and making for Sugar Loaf Bay, so without explaining why, I diverted our small group into the bay behind him. Rafting up next to Garry, we ordered coffees for all and enjoyed the black gold whilst slowly drifting across the bay in the early morning sunshine. Sushine with a bucket of black coffee. Luvverly! With us all now woken up, I considered our paddling options. The tide was out, but slowly coming back into the Harbour, so I thought we’d try to get into Scotts Creek (despite it being near impossible to enter at low tide). Leading the way into the creek’s entrance, with the water less than half a foot deep, we just pushed our way into the creeks deeper waters. It’s really hard to describe the beauty of this hidden part of Middle Harbour, but I still find it to be magical each time I go there. 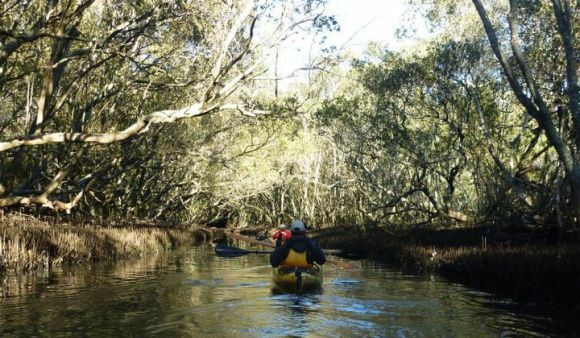 For newcomers, it’s beauty is staggering, with its arching mangroves and cliff overhangs. When we finally hit the end of the end of the creek, we discovered there was no way for the big double to turn around. 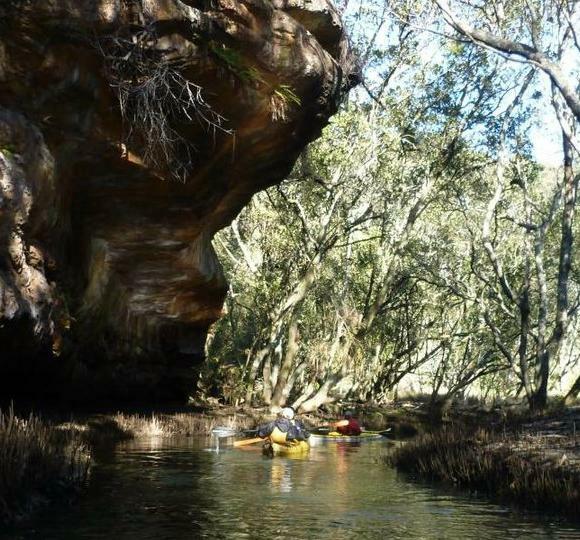 I therefore offered a hand by climbing out of my kayak and manually lifting the nose of their double yak over the creek bank to turn them the right way, in the process near freezing my walnuts off in the cold water. 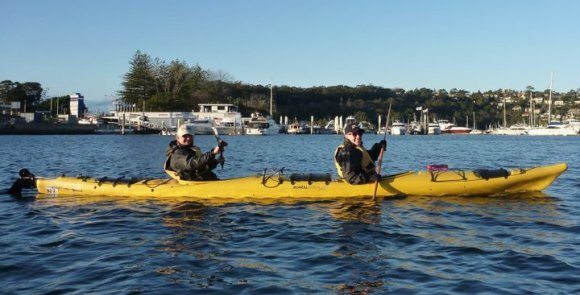 As they paddled off towards Sugar Loaf Bay, I gingerly dragged my freezing legs back into my kayak. 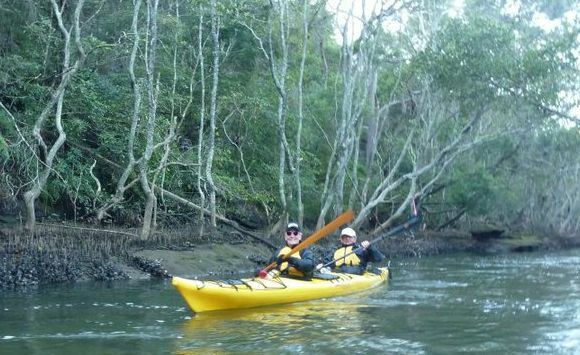 From there we slowly made our way back to The Spit, having lost the best part of 3 hours on our meandering paddle. With a little boat traffic now chopping up the waters, I got the chance to catch a couple of little rides as my visitors put in the paddles to get themselves back. Back to the where the big boats are! Plenty of smiles at the end of the paddle. Cheers!